Ethan Coulson is currently working with the NHS whilst undertaking the Level 2 Diploma in Business Administration. We asked Nathan to share some of his experiences about his time on the course so far. The programme that I am currently undertaking is the Business Administration Level 2 Diploma. The reason why I chose this course is because it puts me on the correct path for my later life goals. This course allows me to indicate the areas that I need to improve in and, on the other hand, where I do well. The unit that I am currently studying is the ‘Principles of business document production and information management’. The part of the course that I enjoy the most is learning information on how businesses are administrated, as I feel like this knowledge will have a positive impact in regards to my progress within the business field of work. The part of the course that I dislike the most are the self-reflection modules as the perspective of my own progression may differ to how it is in reality. I chose to study at CAW Business School because it provided me with the opportunity to gain a qualification whilst being able to support myself with a sufficient wage to carry out the standard daily activities that perhaps someone with a job can do, all in all these two factors give me a good balance between my social life and work. Goals that I aim to achieve in the future involve me being in a management role within the field of work that I am currently involved with now. Advice that I can suggest for anyone that is contemplating applying for an apprenticeship with the NHS/CAW business school is that organisational skills and interpersonal skills are key towards success within this field of work as each of those skills correlates towards the protocol in such a working role as my own. 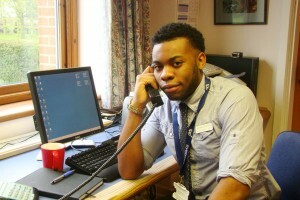 Since beginning my apprenticeship I have progressed in my job role by watching and practising the protocol of service, and this method of learning has allowed me to gain new skills such as scanning documents, administering prescriptions and also co-ordinating telephone/’face-to-face’ appointments with GP’s/practice nurses and patients.